Romeo was added to our herd in 1999. One of my very first students, Emily, had the horse disease. After taking horsemanship lessons at JPF it was time for her to have one of her own. Emily purchased Romeo from a friend of mine—they made a lovely team. I loved Romeo right from the start too—so did one of our other horses, Rebel. (You see, Romeo and Rebel came from the same friend of mine and used to be pasture buddies and are now the best pasture buddies at JPF). When Emily wanted to sell Romeo I jumped at the chance to give Rebel his buddy forever. 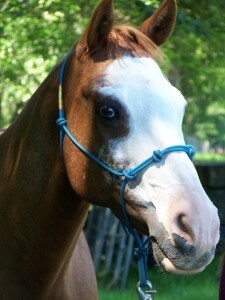 Romeo is one of the cutest and sweetest horses you’ll ever meet. He has an unbeatable temperament and gives his riders a lot of confidence. He is in demand for all levels of riders.